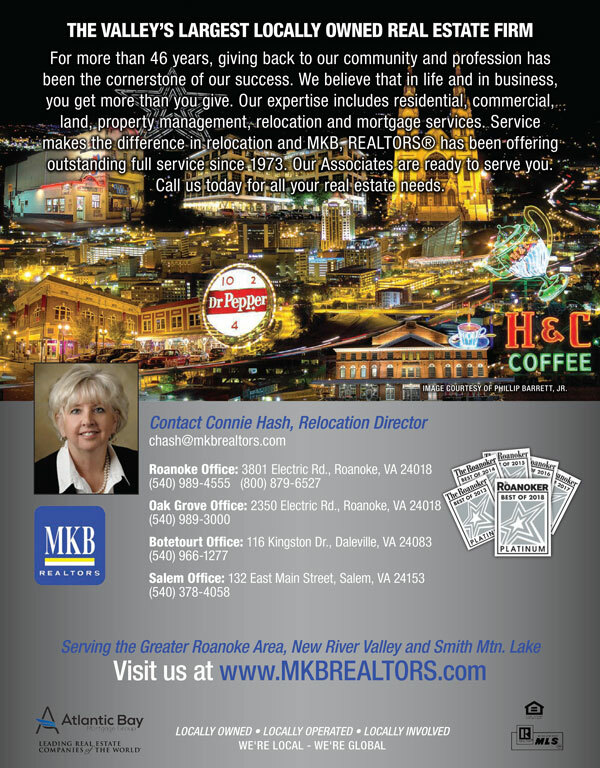 A Roanoke native, Whitney Norbo always knew she wanted to return to her hometown after her college and graduate school years. Her parents, sisters and many other family and friends were still in town; it felt like home. So Whitney found a position as a pediatric nurse practitioner working at Carilion-Roanoke Memorial Hospital and moved back to the same neighborhood where she grew up—the same house even. Like many young professionals just starting out, Whitney initially moved back in with her parents as she started her new job and looked for a place of her own. A call from a friend saying that the charming yellow brick house in South Roanoke, mere blocks from the hospital, might be available spurred Whitney to consider homeownership. 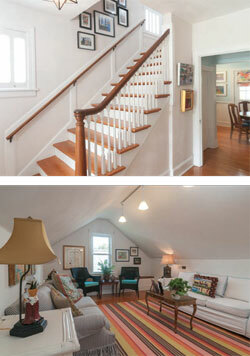 She tracked down the out-of-state owners, who were, in fact, looking to sell and offered to purchase. And the rest, as they say, is history. It’s lucky finds like these that have fueled a life-long hobby of collecting for this young professional. In addition to hanging artwork, Whitney has always had a love of traditional decorative Chinese figurines, platters and vases. She owns dozens and has collected them since childhood. 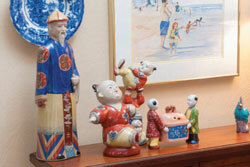 In fact everywhere the eye rests downstairs in this gem of a house the porcelain figurines add a touch of whimsy and youth to an otherwise traditional-style home. There are several lounging on the coffee table, a pair holding up vases on the mantle and another grouping next to family photos on a side table or guarding the decanters and cocktail napkins on a nearby drink tray. The living room is artfully arranged, with comfortable, overstuffed chairs and a couch centered on the painted masonry fireplace and anchored by an area rug in a subtle geometric print. The television is tucked unobtrusively off to the side atop an antique chest and is still at a comfortable viewing distance from the seating. 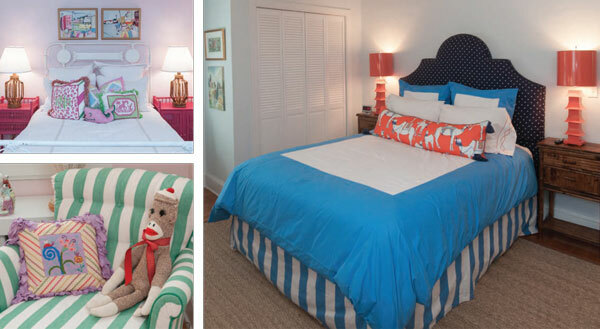 Whitney has chosen to go with the clean lines of white plantation shutters rather than traditional draperies or other window treatments, which contributes to the feeling of brightness throughout the house and doesn’t distract the eye from the artwork or antiques. Scattered around the cozy living room and indeed all over the house, are beautiful hand-stitched needlepoint pillows, which Whitney has made over the years. 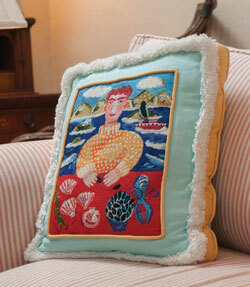 “I love to needlepoint,” she shares, “My sisters and I learned one summer at the beach with my mother and aunt. I’ve just kind of stuck with it, though I don’t have as much time to do it as I used to.” Each of these hand-stitched pieces of art is a testament to dozens of hours of careful needlework and provides decorative accents, but also palpable memories for this young homeowner. 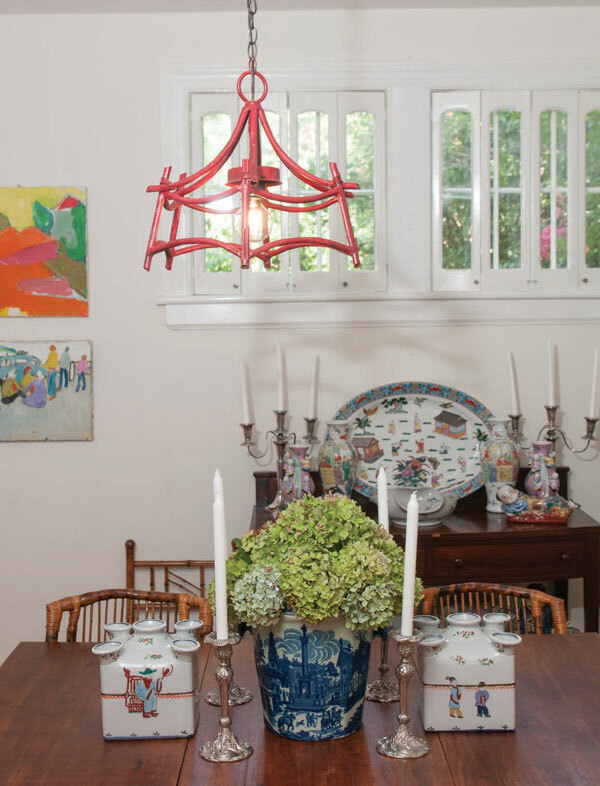 The dining room opens off the living room and here Whitney has refrained from colored walls or carpeted floors, preferring the simplicity of the antique dining room table from her mother’s family with chairs that she finished herself. “I love this table,” says Whitney, hand resting gently on its finish, “My uncle brought it back from Florida and I said, ‘Who’s getting that table? Me?’ I got my wish.” The metalwork chandelier was also a gift from her family, Whitney’s mother Phyllis to be exact. “My mother actually bought the chandelier for herself at an antique store by the beach, but she didn’t have a good spot for it, so she gave it to me.” The dining room is the perfect spot to display more of Whitney’s collection of Asian china and porcelain, where it joins another Ted Turner oil painting, in the antique china cabinet and on the nearby sideboard. 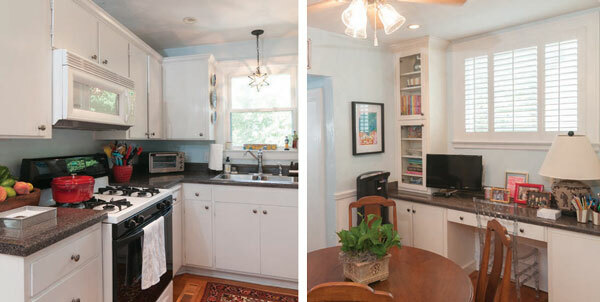 The compact kitchen and eat-in dining area at the rear of the house is a tribute to efficiency. Whitney explains that she didn’t have to do much more than paint the walls and switch out a few light fixtures to make the room her own. There’s a clever builtin desk/computer workstation with lovely built-in bookshelves, which give Whitney extra storage as well as a home-office of sorts. 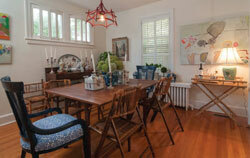 There’s another heirloom dining table in here with matching chairs that Whitney has had covered with crisp navy blue monogrammed seat cushions. 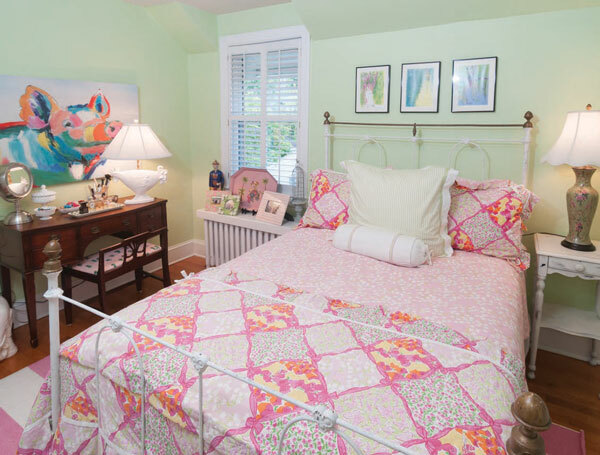 The precious Pig Painting, a Pawley’s Island find, is the perfect artwork for the Lilly Pulitzer bedding Whitney reused from her college and grad school days. Whitney has put some time and effort into the outdoor areas of her home as well. “All of this was really overgrown when I got here,” says Whitney, gesturing to the charming brick patio, lawn and enchanting mixture of shrubs, trees, rose bushes and ferns in pots. “I started slowly, just pulling weeds and cutting things back…a LOT. Then got some fresh plants in. 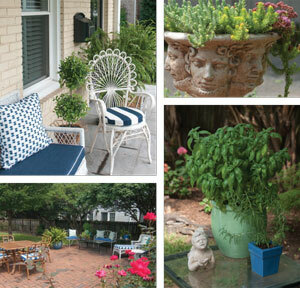 I’m hoping they’ll grow.” The back yard is sheltered and indeed it seems as if Whitney’s plantings will thrive—she has graciously opened her home and yard for this year’s Historic Garden Week. The yard itself is fully fenced and includes a small garage at the rear of the property—just a stone’s throw from the small, walkable business and restaurant district at Crystal Spring and McLanahan, one would never know it. The yard is quiet and smells like roses from the several bushes Whitney has planted. A custom metal gate divides the front part of the driveway from the back and completes the enclosure of the back yard so that it feels like an oasis of calm under the shade of the large old trees. 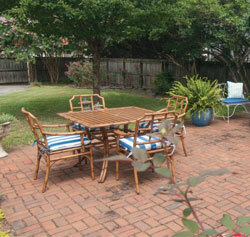 The large brick patio is laid out in conversational groupings: a bamboo table for four in one corner, wicker chairs in another, a relaxing chaise lounge in another. 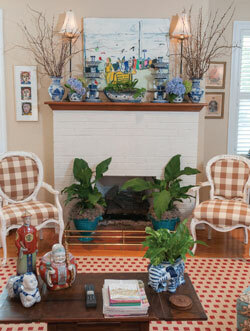 Whitney has had crisp navy blue and white cushions custom-made for each of these arrangements, as well as those on the front porch. 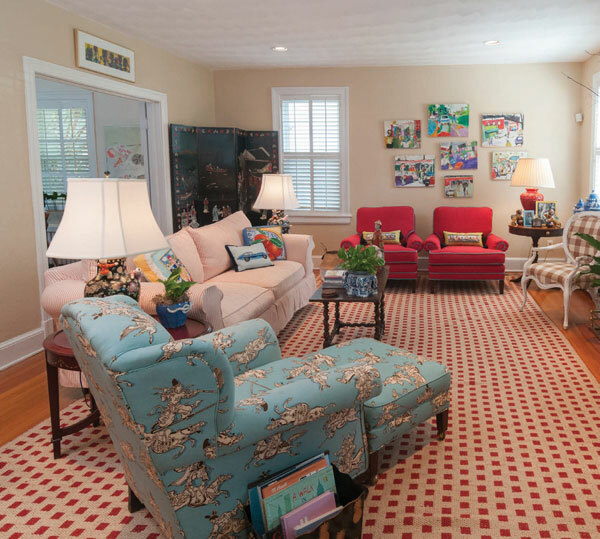 Her guests and visitors to the yard are sure to appreciate both the comfort and the bright pop of color these provide amidst the green lushness of the carefully maintained yard. A pair of crepe myrtles offers a shady respite on the rear patio. 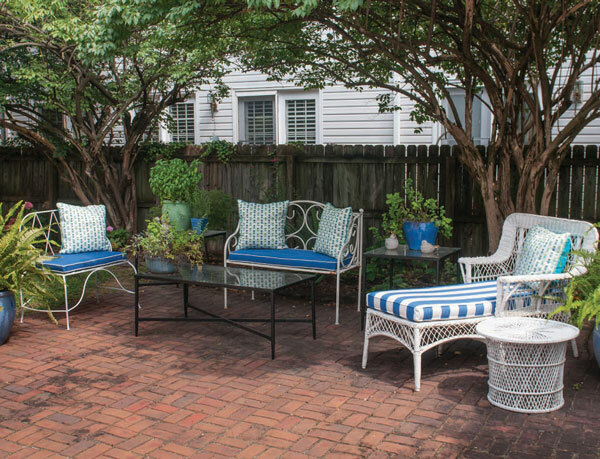 The vibrant blue and white chaise and wrought iron set add the right pop of color to the outdoor space.